April early afternoon the causeway breached resulting in a major washout of the road bed cutting off access to about 20 cottage properties on Fire Route 52.
WHO OWN THE CAUSEWAY AND CULVERT? The Townhip of Buleigh Anstruther ( now incorpoataed into North Kawartha) took ownership of 2 part of land subdivided by Peterborough Lumber Company being Part 49 and Part 50 plan R 364. Both parts have original 66 Shore Road Allowances under ownership of the municipality which are considerde to be PUBLIC HIGHWAYS. Aug 6th a meeting was held near the site of the culvert to discuss past and on going cost associated with keeping the culvert functioning in face of persistent beaver activity which requires additional expenditures. At that meeting it was generally agreed that since the causeway and culvert is located on Municipal property that we would submit a request that the municipality take back resposibilty for culvert maintenance as was the case in years past. 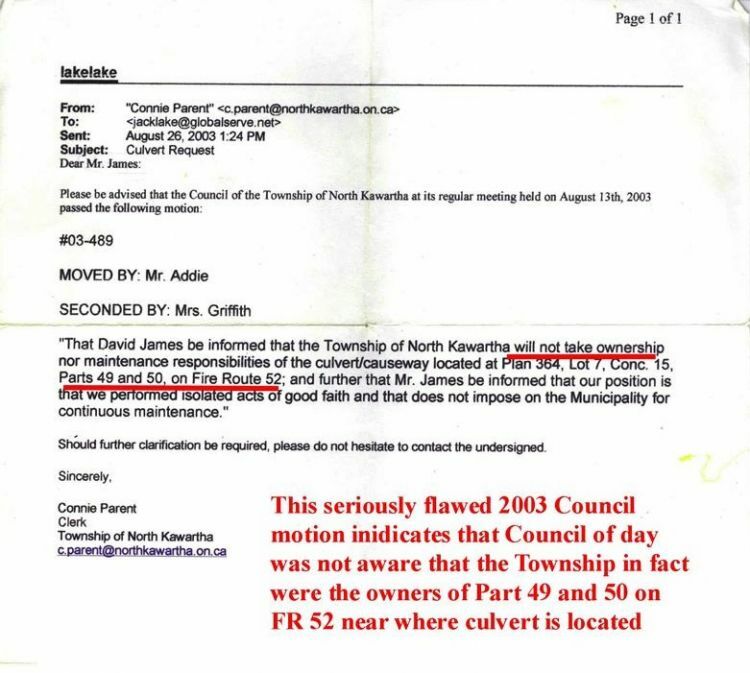 This is a draft version of the letter submited to Council by Doug Leppert on behalf of affected cottagers .it is understood final version is similar to the draft. Following discussion with Staff -Twp Lawyer -Council and Road Users in attendance along with presenation by Doug Leppert-Council unanimously agreEd to a motion to undertake certain culvert maintenaNce on the township owned fr 52 culvert going forward.